NutriSphere-N® (also known as NutriSphere-N® Nitrogen Fertilizer Manager, or N-N) is a polymer-based, enhanced efficiency fertilizer product made and distributed by Verdesian Life Sciences. It can be coated onto granular fertilizers like urea or injected into UAN solutions. Like many enhanced efficiency fertilizers, NutriSphere-N® is advertised to improve crop consumption and increase yield by decreasing the rates of nitrogen loss via volatilization, leaching, and denitrification through suppression of urease and nitrification activity. 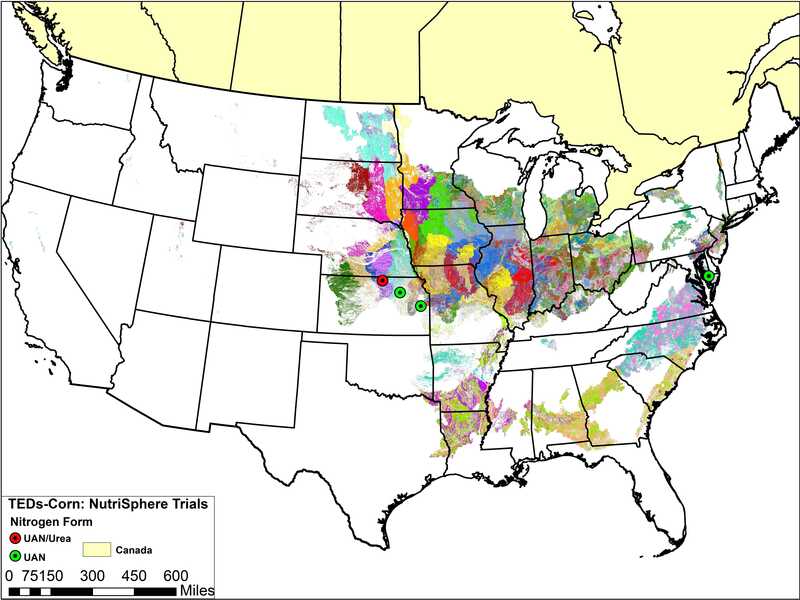 Where has NutriSphere-N® been tested? 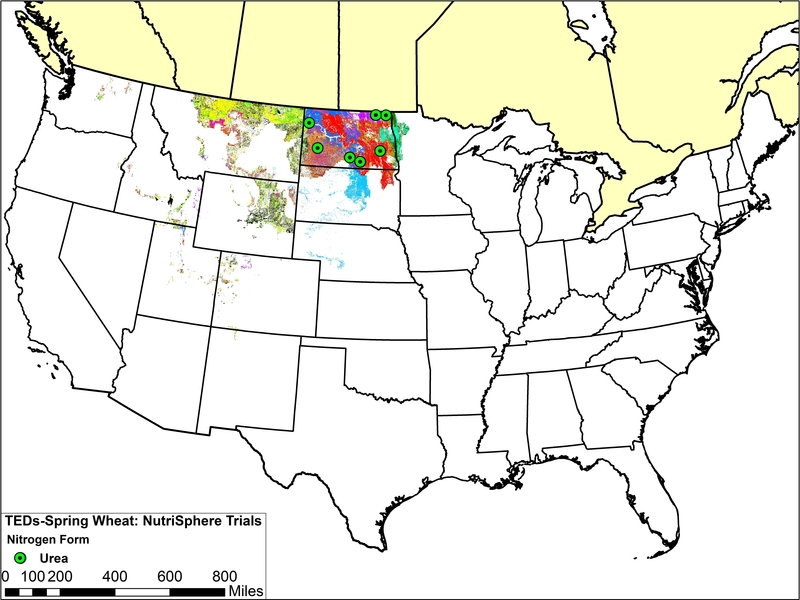 The map below shows trial locations for corn and wheat. The trial locations have been superimposed over the Technology Extrapolation Domains (TED) Framework. The TED Framework is described further on the Nutrisphere-N® and TED Framework page. 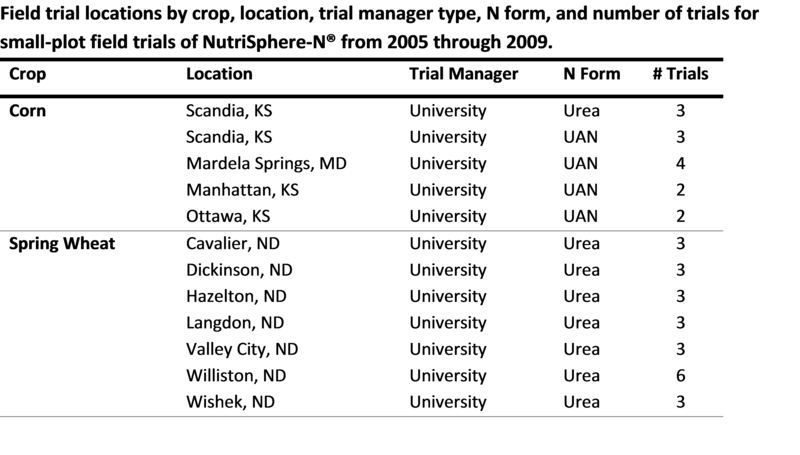 A review of the available data shows a wide range in results for NutriSphere-N®. Although certain studies found it to be promising, results were inconsistent. Even with some indication of yield benefits for grain corn, and because of the lack of studies testing N losses, the available data are too limited to conclude that this product improves yield across the board or provides other significant improvements in N efficiency. Therefore, if the product is to be considered further for such purposes and there is any expectation of effectiveness under specific conditions, proof of such is needed. This would require more data collection. To see if Nutrisphere-N® trial locations are relevant to your operation, visit the Nutrisphere-N® and TED Framework page. To view the complete research report, including references, please visit the NutriSphere-N® Research Findings page.